3.8 out of 5 based on 116 bloggers and 24 commenters. 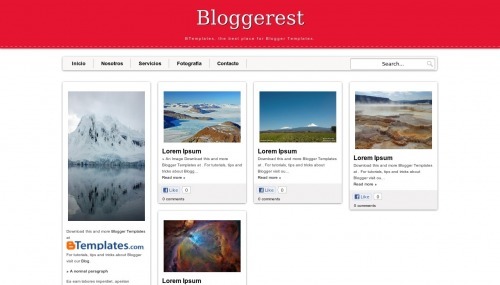 Bloggerest is a free blogger template with 2 columns, responsive design, right sidebar, gallery-styled, an exclusive design for Blogger, posts thumbnails, drop down menu and well designed threaded comments. Excellent template for blogs about crafts, health and beauty, internet, photography or travel. nice template thsnks 4 sharing dis………………..
Gracias por la plantilla, esta muy bonita, probé con varias y esta me convenció totalmente. I love this template! I was curious though if there is a way to edit it so anyone can comment, without connecting an account like aim or google? hi, i had amazing experience with the template but i just have one question i am able to display only 7 or less posts on the home page, even i have set the max limit as 20. I am starting to use it today for my gallery blog, and I love it already. The layout is great and seems that there won’t be much problem adding Google Adsense as well. thank you this really cool template??? I received a virus warning. please all of you check your system. The template won’t show some of the titles of my blog posts… Can anyone help? How do I change the header color? thkx for share it rely its nice tamplet..
Template này rất hợp để mình làm thêm 1 trang web về dịch vụ sửa tivi của mình. thank you! Great blog very informative thanks to share.